Please note: there are several Rignacs in France. My Rignac is a very small village near Gramat and Rocamadour, not the large town in the Aveyron you will find on maps. 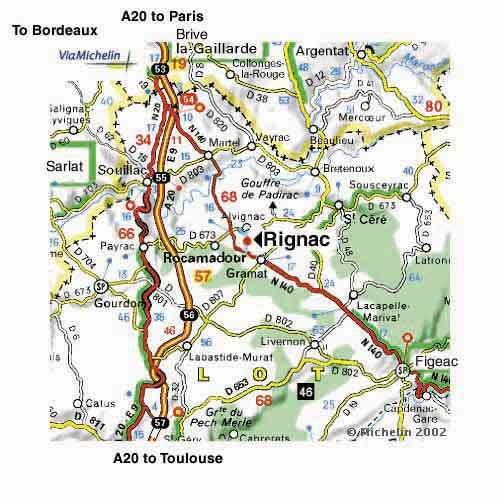 So please follow my directions and don't just head off to any Rignac you spot on a map! Take the autoroute A20 (direction Toulouse) to Brive-la-Gaillarde. This is about four and a half hours. Ten minutes or so after Brive, take exit 54 and leave autoroute for the D840 (still N140 on some maps), direction Martel, Gramat, Rocamadour. Go through Martel and continue for about fifteen minutes, past the first turnoff to Rocamadour (right), Alvignac (left). At the second turnoff to Rocamadour (right), turn left into the tiny D36 road to Rignac. When you get into Rignac, turn left at the T junction, just past the church. Then take the first road right (which is still the D36, direction Lavergne.) Le Tramizal is the second house on the left, up some steps. If you arrive at Gramat, you have missed the turnoff. Turn around and go back up the D840. You will see a road marked the D20, Vayrac, Rignac, Alvignac. Take that road over the hill, down into the valley, and cross a small bridge. Go up the road through the village and then take the first right. Le Tramizal is second house on left. If you are taking the train to Brive and then renting a car, there is a shortcut south. On leaving station and car rental places, turn right into Fontaine Bleue or Clemenceau and then right again into Ave Leon Blum. Continue under railway bridge and up hill on this road which becomes the 920, towards Noailles. This road will link up with the A20 south. The drive is about 50 minutes. You can arrange in advance to have car left for you at the station if the car rental agency is shut for a lunch or it's a Sunday or other holiday. Head northwest out of Toulouse on the road to Bordeaux and then turn off on the A20 to Montauban and Paris. Keep going north past Cahors and take exit 56 off the autoroute for Gramat. You will go around two circles and then north on the D807 to Gramat. In Gramat, join up with the D840 (still N140 on some maps), direction Brive. Five minutes later, you will see a road marked the D20, Vayrac, Rignac, Alvignac to the right. Take that road over the hill, down into the valley, and cross a small bridge into Rignac. Go up the road through the village and take the first right. (A sign says Pouch, Vergnoles, Darnis, etc.) Le Tramizal is second house on left, up some steps. Try not to arrive after dark because if you get lost, it will be more difficult to find me. And please note, there are several Rignacs in the area, so do not follow signs to other Rignacs which you might see sign posted, or on a map. Pick up a sandwich, fruit and water at the station before leaving. The food on the train is awful and very expensive. You can also get magazines and international newspapers at the station.  Get your ticket dated before getting on the train by inserting it into orange or yellow box in the station. You will see others doing this. Very important. Conductors can fine you if you don't do this, though if you are a foreigner, they usually just grumble and let you get away with it.  There are wonderful new showers at Austerlitz if you need to kill time waiting for a train. I highly recommend them. You are given towels and soap and are just what you need if you have just flown in after a long trip and just missed a train.